This section demonstrates how to configure a reseller who will be providing services under his own name. 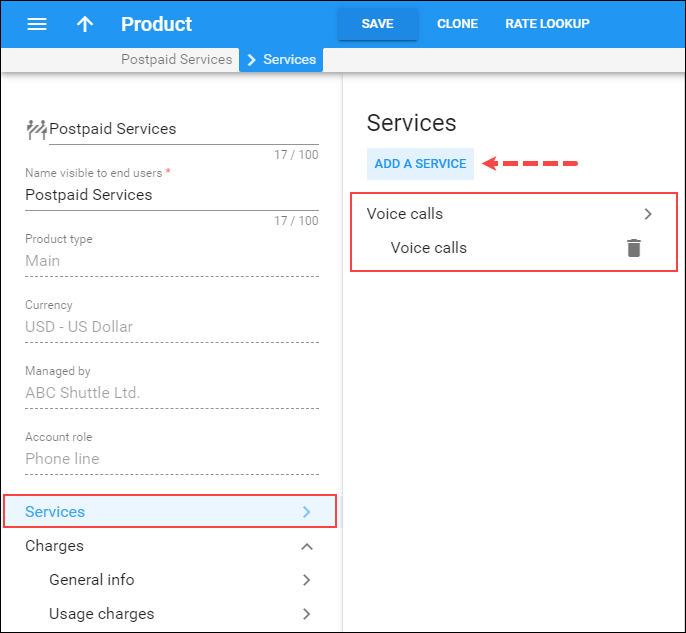 The postpaid residential VoIP service is used as an example, but the procedure is basically the same for configuring any other service (e.g. PINless dial or business IP Centrex), the only difference being which nodes are used in the product’s rating list. Please consult the handbook for a given service regarding its specific configuration details. · Resellers are not allowed to create new tariffs or products. In addition to security considerations, this is because rating list to a product must be configured in order to create it properly. The person doing this must be well-acquainted with your VoIP network structure (gateways, access lines, etc). Your reseller will not have this knowledge; in fact you will probably not even want to share such information with him. Therefore, your admin staff will create an initial framework of tariffs and products for him, and configure the products’ rating list. If the reseller wants to sell a product under a different name later, he can simply clone the existing product. 1. Create the tariff you will use to charge the resellers (Applied to: Reseller type). 2. Create a reseller, assigning this tariff to him. 3. Create tariffs and products for his subscribers, making sure that you mark them as Managed by that reseller. · Unless assigned the “Advanced Reseller” access level, resellers are not able to view their own rates on the web interface, so that you are in control when informing them of rate changes. For example, at the beginning of the month you may choose to enter a rate change effective the first day of the following month; however, you can notify the customer of this only one week in advance. · To allow resellers create accounts regarded as a phone line having a unique phone number (DID), your admin must also perform the configuration of the DID provisioning for reseller. Please use the checklist on the following page to ensure that you have performed all the required operations in the correct sequence. Print the following page and use it to mark the operations you have completed while performing the system setup according to the instructions in this section. Please make sure that you perform all of the operations in the order designated (all of the boxes should be checked), otherwise the service will not work. Create one rating entry for this product, using the PortaSIP® node and an empty access code. This entry will use tariff C to charge the end user and tariff A to charge the reseller. Create another rating entry for this product, using the PortaSIP® node and the access code INCOMING. This entry will use tariff D to charge the end user and tariff B to charge the reseller. As mentioned in the checklist, you will need two separate tariffs: one applied to outgoing calls (including forwarded calls) and one applied to incoming calls. These tariffs will be used to charge the reseller, so they should contain your selling rates for the reseller. · Name – Type a short name for the tariff object; this is the name you will see in the select menus, (for example, Reseller). · Currency – This indicates the currency in which you charge your resellers. · Applied to – Select Reseller here. Rates are per-destination prices. Please refer to the Real-Time Charging chapter in the PortaBilling Administrator Guide for more details on billing parameters. 1. On the reseller’s tariff panel, click Rates. 2. On the Add rate panel, fill in the rate details. · Destination – Select a destination prefix from the list or type it in directly (e.g. 47 for Norway). · Interval first – First billing unit in seconds. · Interval next – Next billing unit in seconds. · Price first – Per-minute price for first interval. · Price next – Per-minute price for next interval. 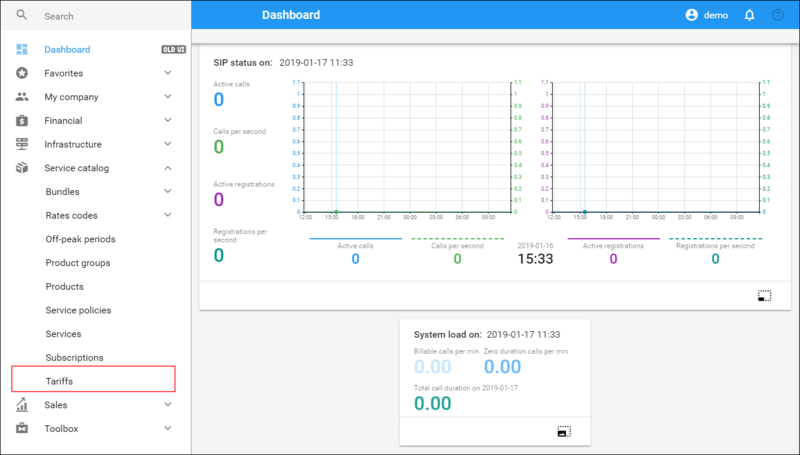 · Off-peak interval first – First billing unit in seconds for off-peak time. · Off-peak interval next – Next billing unit in seconds for off-peak time. · Off-peak price first – Per-minute price for first interval of off-peak time. · Off-peak price next – Per-minute price for next interval of off-peak time. NOTE: Off-peak fields appear only if this tariff has already been assigned an off-peak period in the General info panel. · Effective from – If you want this rate to take effect sometime in the future, you can either type in a date manually, or use the calendar (click the DD-MM-YYYY link). NOTE: When using the calendar, you can specify that the date you are entering is in a different time zone than your current one. PortaBilling® will then automatically adjust the time. · Rate formula – Click the Wizard icon to launch the wizard for creating a custom rating formula. · Payback Rate, Hidden, Forbidden or Discontinued – These flags are optional. You also can upload rates from a .csv or .xls file – please consult the Rate Import section. The process of entering incoming call rates is similar to the one described above. 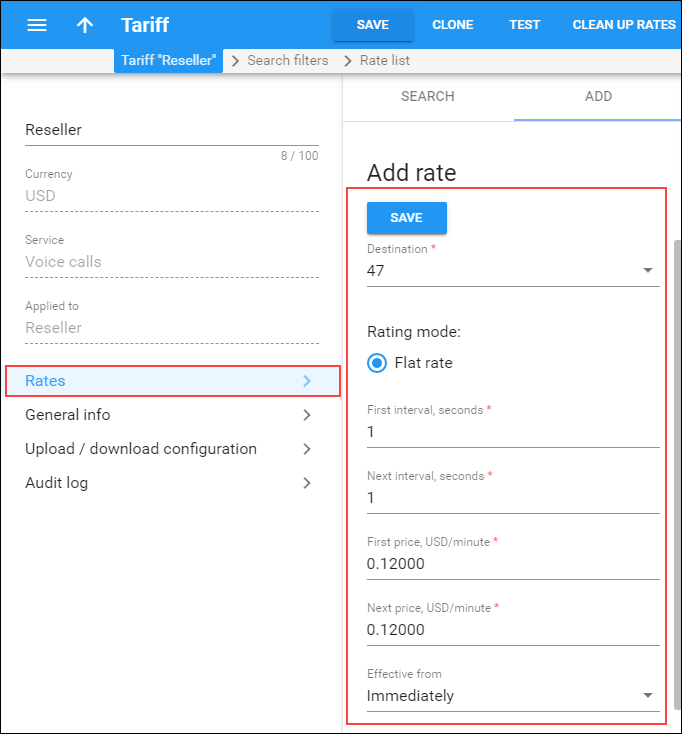 If you do not actually charge the reseller for incoming calls (in most cases, there is no cost associated with them), or charge him the same rate for numbers in various countries, you can simply use the wildcard destination (|) to enter a single rate in the tariff. 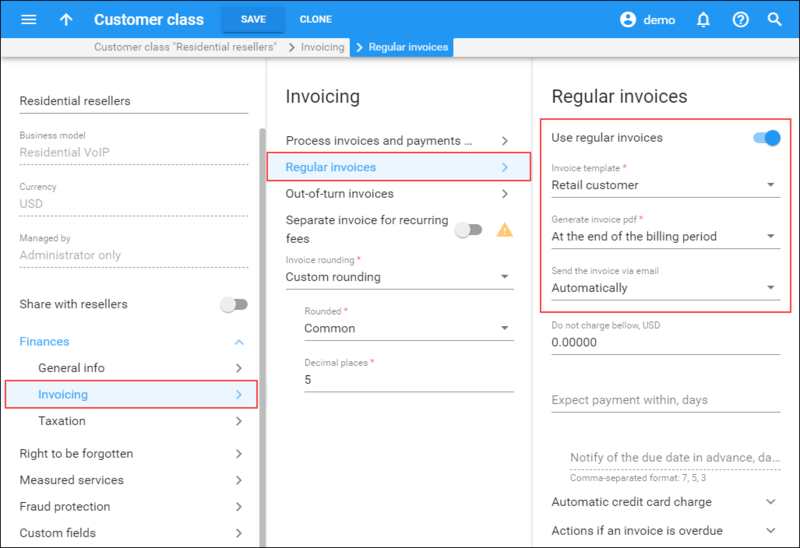 If the invoicing and collection parameters for resellers are not relevant at this moment, skip this step and use the Default customer class for your resellers. · Business model – Select which services this reseller will be providing. Select Residential VoIP. · Currency – Specify the currency in which you want to set the collection threshold. When specified, this customer class can only be assigned to resellers and their customers with the same currency. Once the currency selection is saved, it cannot be changed. o Generate invoices – Leave this option enabled to generate invoices for resellers who belong to this customer class. o Suspend on insufficient funds for subscriptions – Specify whether PortaBilling® should check whether the reseller has sufficient funds for their subscription charges. o Permanently terminate customers after provisional termination - Enable this option to permanently terminate resellers and define the amount of days for termination delay. 6. 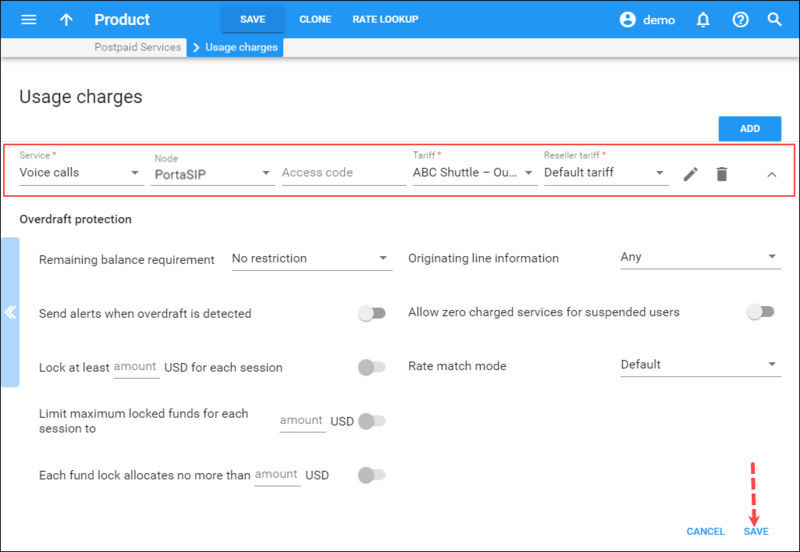 On your customer class panel, click Finances, click Invoicing, then click Regular invoices. · Invoice template – Select the appropriate template which will be used to create a .pdf file with the invoice for your customers (e.g. Retail customer invoice template). 8. On the Taxation panel, select the taxation method and specify the taxation parameters. For now, you may leave the rest of configuration parameters with their default values. If you change them later, these changes will automatically affect all resellers that are already assigned to this customer class. The reseller entity you are about to create will define your relationship with a business partner who is reselling your services under his own name and allow them further independent service management (e.g. creating their own customers and accounts). 1. On the navigation menu, select Sales, then Sales agents and click Resellers. · Name – A short name for this reseller; this will be used on the web interface. · Customer class – Customer class allows you to define a a group of parameters. By choosing a specific class here the reseller and their customers will automatically inherit all of the class properties (grace period, invoice template, payment collection etc.). Select the customer class you have just created. · Currency – The currency in which this reseller will be billed. · Billing period – Choose a billing period for the reseller. A billing period defines the frequency of invoicing for this reseller. · The default tariff for voice calls – This is the tariff that will be applied by default to calls placed by the reseller’s subscribers. Select tariff A here. · Credit limit – Assign a credit limit for the reseller. Define the reseller’s personal information (such as name, email address, and etc.). 1. On your reseller’s panel, click Company info, then click General info. 2. On the General info panel, fill in the reseller’s personal information and an email address for the receipt of accounting information. After the billing period is over, a list of xDRs and other statistics will be sent to this address. Define credentials and preferred settings (such as language, time zone, date input and output formats) for this reseller’s self-care interface. 3. While on the General info panel, click Web self-care. 4. 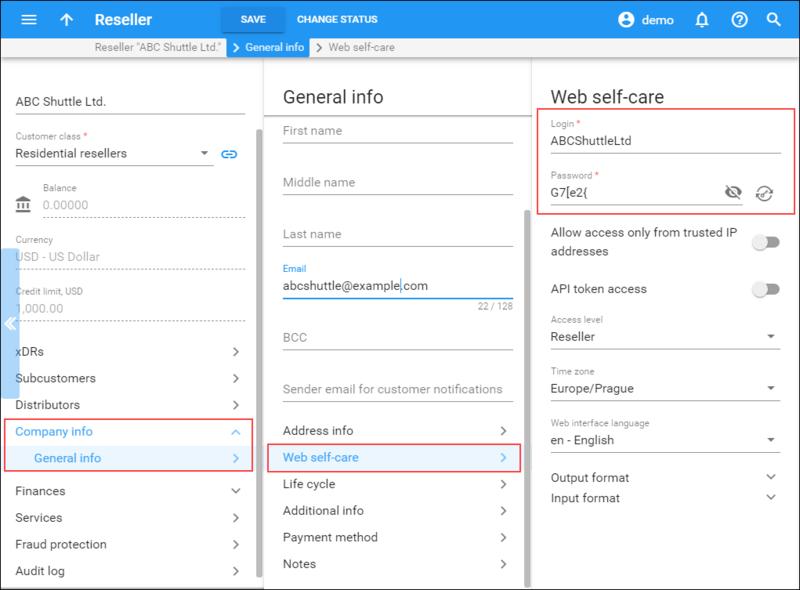 On the Web self-care panel, define credentials for the reseller self-care interface (such as login, password, time zone, etc.) and other preferred settings. The time zone you define for the reseller defines their billing period and when the reseller will see their xDRs, For example, if you choose America / Vancouver here and the billing period is Monthly, the billing period will start on the first day of the month at midnight (12 a.m.) New York time. 4. On your reseller’s panel, click Finances, click General info, then click Credit limit. · As a percentage (e.g. 90%). The warning will be sent when the reseller’s balance exceeds that percentage of his credit limit. So, if the credit limit is USD 1000.00 and the threshold is 90%, a warning will be sent as soon as the balance exceeds USD 900.00. This is only applicable when the customer has a positive credit limit. The reseller will use these tariffs to charge their subcustomers. Since the rates for outgoing and incoming calls are different, you will need two tariffs. The reseller will perform the actual tariff configuration on the self-care interface. You just need to provide him with a framework by pre-allocating tariffs. · Currency – This indicates the currency in which the reseller charges their customers. · Applied to – Select Customer here. · Managed by – Select the name of the reseller you have created here. 4. Repeat steps 1–3 until you have entered all of the tariffs your reseller needs (e.g. 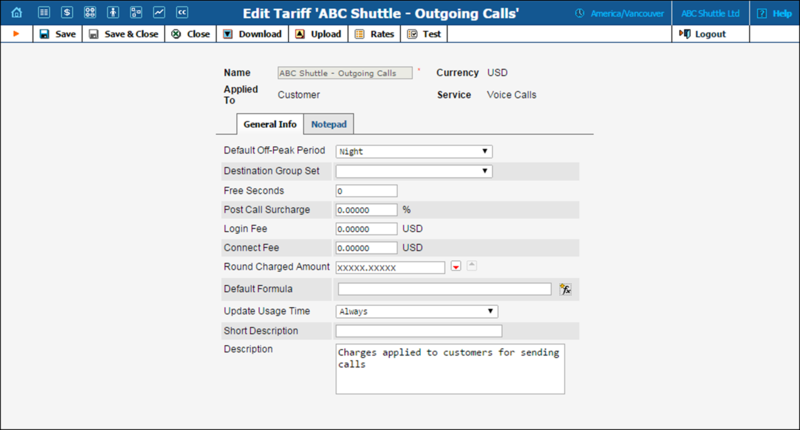 ABC Shuttle – Incoming Calls, the tariff that will be applied to incoming calls). Optionally, you can add rates to this tariff. The procedure is the same as described in the Add rates to the tariff subsection of the Create a Tariff for Charging the Reseller section of this handbook. · Name – Type an internal product name that will be shown on the web interface. · Name visible to end users – Type a name of the product that will be shown to end users on their self-care interfaces. · Account role – Select Phone line since this product is intended for making calls. · Managed by – Select your reseller from the list. This entry defines the tariff to be used when a customer of the reseller places an outgoing call. 1. On the product’s panel, click Charges, then click Usage charges. 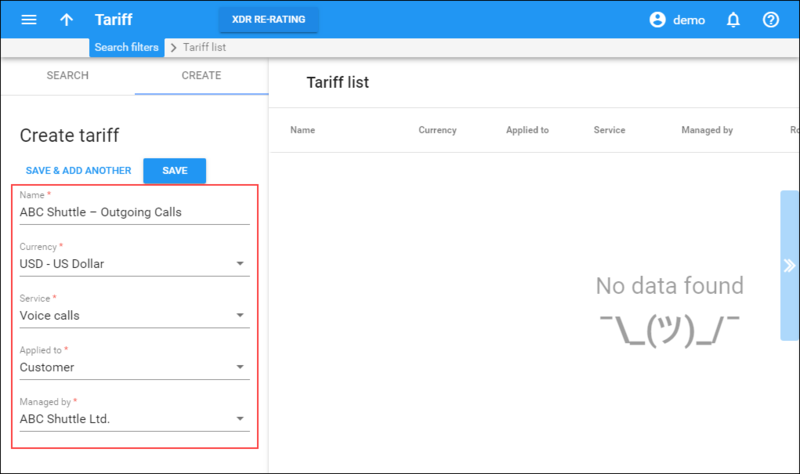 · Reseller tariff – select the tariff that will be used to charge the reseller when an account with this product makes a phone call. You can leave the DEFAULT TARIFF. This will be the same tariff as you have assigned it as a default one when creating a reseller (e.g. Reseller). This entry defines the tariff to be used when a customer of the reseller receives an incoming call. 1. On the Usage charges panel, click Add. · Access code – Type in INCOMING; this entry will then be used for calls going to end user’s IP phones. · Reseller tariff – select the tariff that will be used to charge the reseller when an account with this product receives a phone call, referred to here as tariff B (e.g. Reseller Incoming). Otherwise, the system will apply the resellers’ default tariff. This is probably undesirable, since that tariff contains rates for outgoing calls. For more information about the available product features, please refer to the System Concepts section of the PortaBilling Administrator Guide. In the case of Residential VoIP service, an account is regarded as a phone line having a unique phone number (DID). This phone number serves as an account ID within PortaBilling® and is provided by your termination partners. To allow resellers create accounts for their customers, perform the configuration of the DID provisioning for the reseller according to the instructions provided in the DID Provisioning for Reseller (DID Inventory) handbook. At this point you have finished with the administrator part of the work. You just need to send the reseller his login credentials for the PortaBilling® self-care interface, while the rest of the tasks described below will be performed by the reseller himself. They are listed here for your convenience only; normally the reseller will use the instructions in the self-care guide. Open the customer self-care page in a browser (by default https://<your-porta-billing-slave-server-name>:8442) and type in the username / password which was provided to you. NOTE: Sometimes administrators try pressing the Logout button on the admin interface and then logging in using the reseller’s username and password. This will not work, since you are still in the admin realm, to which your reseller does not have access. You must login from the customer’s self-care interface. The reseller can adjust various parameters of a tariff (e.g. off-peak period or rounding). 1. In the Rating section of Reseller-Index, choose Tariffs. 2. On the Tariff Management page, click on the name of the existing tariff. · Default Off-Peak Period – If you do not differentiate between peak and off-peak rates, just choose Not defined; otherwise, select one of the previously defined off-peak periods. · Round Charged Amount – Instead of calculating xDRs with a 5-decimal-place precision, round up xDR amount values (e.g. XXXXX.XX000 means rounding to cents, so that 1.16730 becomes 1.17). · Default Formula – The default rating formula which will be applied to every new rate created in the tariff. If you leave this empty, “old-style” rating will be used. · Short Description – A short tariff description. This will be shown in the rate lookup on the admin interface and the self-care pages for your accounts and customers. For example, for a tariff named Cust-ABC-Easy Call-1800, the short description will provide better information for your reseller ABC, who will be using this tariff, such as: “EasyCall – via a toll-free number”. · Description – An extended tariff description. 5. Repeat steps 1–4 until you have adjusted all of the tariffs. The interface for rate management by the reseller is identical to the one, provided to the administrator and described earlier in this chapter. This is similar to the process of adjusting outgoing rates, as described above. 1. While in the Edit Tariff window, click on the Test button to go to the Test Call Rating screen. 2. Type in the phone number for which you would like to test the rating, as well as the estimated call duration, then click on the Test button. 3. You will now see the estimated amount charged for this call, as well as a detailed explanation of the rating process. 4. Press the Close button to return to the Edit Tariff window. If necessary, you may modify certain product parameters, e.g. maintenance fee amounts and scheduling. 1. In the Rating section of the Reseller-Index page, choose Products. 2. 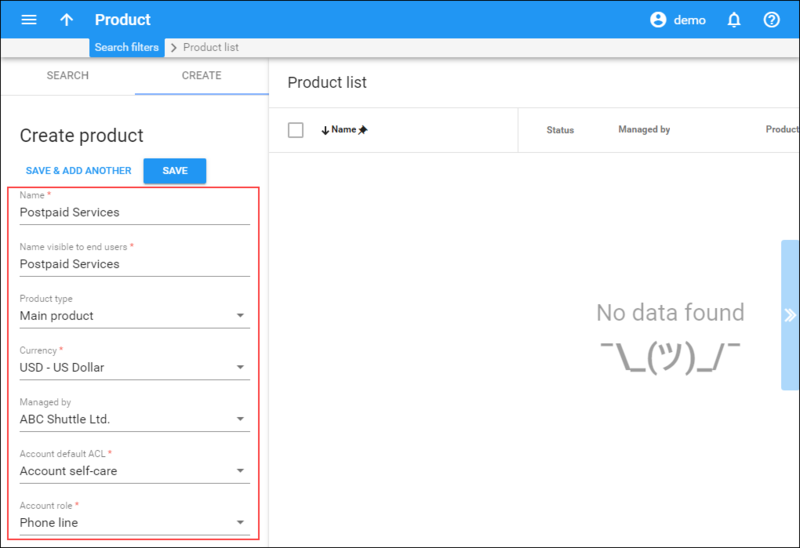 On the Product Management page, click on the name of the product in the list. · Product Name Visible to End User – Specify the name of the product that your customers will see on their self-care interface. · Overdraft Protection - Select the way overdraft protection will be applied to accounts using this product. · Breakage – A leftover balance which is considered “useless” (for statistical purposes). Accounts with a balance below breakage will count as depleted. This does not affect account authentication or authorization, so the account can still make calls if there is enough money left to cover at least the first interval. · Info URL – If you have an external server with a description of product features, enter the URL here (e.g. http://www.myproduct.com). Your customers will be able to go there from their self-care pages. · Description Visible to End User – Provide a description to be shown to end users on their self-care interfaces. · Description – Your description of the intended use of this product. 4. Click Save & Close. A customer is an owner of accounts (phone lines). The customer’s contact information is used to distribute account usage information, call statistics, invoices, and so on. 1. In the Participants section of the Reseller-Index page, choose Customers. 2. On the Customer Management page, choose Add. · Customer ID – Short name for the customer object; this will be used on the web interface. · Customer Class – By default, your customer class will be applied. This means that all invoicing and payment collection parameters that are defined will be applicable to this customer. · Balance Control - Specify the way the customer will pay for the service: Postpaid – after consuming the services; Prepaid – prior to consuming the services. Choose Postpaid in this field. · Currency – The currency in which this customer will be billed. · Permanent Credit Limit – Assign a credit limit for the customer. · E-mail – E-mail address for distribution of accounting information. After the billing period is over, a list of xDRs and other statistics will be sent to this address. · BCC – Delivery to the specified email address of your account representative a copy of every outgoing email sent to the customer; this may be used for debug and archiving purposes. · Time Zone – The time zone in which the customer will see his xDRs, and which will also define his billing period. For example, if you choose America / New_York here and the billing period is Monthly, the billing period will start on the first day of the month at midnight (12 am) New York time. · Web Interface Language – The language to be used on the customer’s self-care web interface. · Billing Time Zone – Time zone in which customer’s billing period will be closed and invoices will be generated. 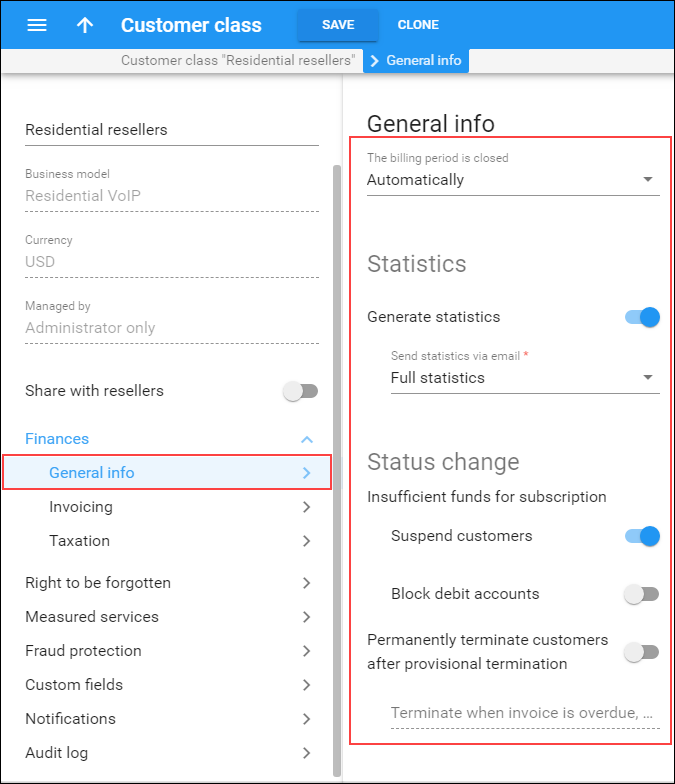 · Last Day of the Period – Read-only field available only during customer creation; shows the last date of the customer’s first billing period. · Invoiced on – Read-only field available only during customer creation; shows a date when customer’s invoice will be generated. · Send statistics via email – Summary only – Distribute a call summary only, and do not attach a details file; this might be useful in the case of a large amount of calls. Other options are full statistics (attach a complete list of xDRs) or do not send (this option prevents the delivery of event statistics to this customer via email). 2. Next to the customer name, click on the Account or icon (in the Accounts column), which will take you to the account management for that customer. · Account Role – The defined usage for this account. Select Phone line. · Main Product – Choose the main product, which you would like your account to have. · Account ID – SIP ID, i.e. the phone number which will be used to login to the SIP server and receive incoming calls. · Blocked – You may create your account as blocked, although this is rarely done with SIP service accounts. · Type – Account type; select credit for postpaid and debit for prepaid service. · Email – Enter the account owner’s email address here. If he ever forgets his password for the web self-care pages, he will be able to reset it, and a new password will be sent to this email address. You can also just leave this field empty. · Batch – A batch is typically used to manage large quantities of one customer’s accounts, so it can be left empty for residential VoIP service – in other words, the account created will not be tied to any specific batch. · Customer Site – Select the customer site to be applied to this account. Leave None here. · CPE – When using the PortaSwitch® auto-provisioning feature, here you may enter the name of the particular phone which this account will be provisioned to. Leave this field empty for basic SIP service, and use manual provisioning instead. · CPE Port – The specific port (phone line) on the IP phone which this account should be provisioned to (e.g. Sipura-2002 supports two phone lines, so two separate accounts can be provisioned on the same device on different lines). Leave this field empty for basic SIP service, and use manual provisioning instead. · Specific Date – Identifies the date that the account expires. Since we are setting up a postpaid service, which should function for a long time, leave this field blank. · ____days after First Use – Defines the number of days the account remains active after its first use or recharge. Since we are setting up a postpaid service, which should function for a long time, leave this field blank. · ____days after Last Use – Defines the number of days the account remains active after its last use or recharge. Since we are setting up a postpaid service, which should function for a long time, leave this field blank. · Login – Account login to web self-care pages. Can be the same as account ID. · Time Zone – When an account owner (SIP services subscriber) accesses web self-care pages to see a list of his calls, we can show the time in the time zone most appropriate for him. · Web Interface Language – The language to be used on the customer self-care web interface. Please consult the PortaBilling Help for a description of parameters available here. For now you may leave these with their default values. 5. After clicking Save & Close, you will see a confirmation screen announcing that a new account has been created. Repeat steps 3–5 if the customer has more than one phone line (extension).